The widened definition of Connectivity has seen an improvement in the rankings for several Asian countries, and a decline for several Eastern European countries. Overall, though, the leaders in Connectivity are Switzerland, Sweden and the United Kingdom. Environment is topped by New Zealand and the Netherlands. Resource levels are highest in Denmark, followed by Canada, Sweden and the United Sates. The biggest change since the 2013 rankings has been a fall of five places by Bulgaria, Hungary and the Russian Federation occasioned by relative declines in government expenditure. On Output measures, the top five countries are the same as in 2013: the United States is again clearly first followed by the United Kingdom, Canada, Sweden and Finland. Among the top eight countries for Output, all but two (the United Kingdom and Australia) are in the top eight for Resources. Our main ranking compares a country’s performance against the best in the world on each measure. In our auxiliary ranking, countries are scored on how they perform on each of the 24 measures relative to countries at similar stages of economic development as measured by GDP per capita. This produces marked changes in ranking. China (becomes ninth), India (becomes 23rd) and South Africa (becomes 17th) all improve their overall ranking by at least 25 places, although the three top-ranked countries are Sweden, Finland and Denmark. A noticeable feature is that several lower income countries show very marked improvements in the Connectivity ranking (the top two are now South Africa and Thailand, and Indonesia becomes seventh), an activity that is likely to be most beneficial to economic growth. 24 desirable attributes are grouped under four broad headings: Resources, Environment, Connectivity and Output. The Resources component covers government expenditure, total expenditure, and R&D expenditure in tertiary institutions. The Environment module comprises a quantitative index of the policy and regulatory environment, the gender balance of students and academic staff, and a data quality variable. The Connectivity component has been extended by including measures of interaction with business and industry, in addition to numbers of international students, research articles written with international collaborators and web-based connectivity. 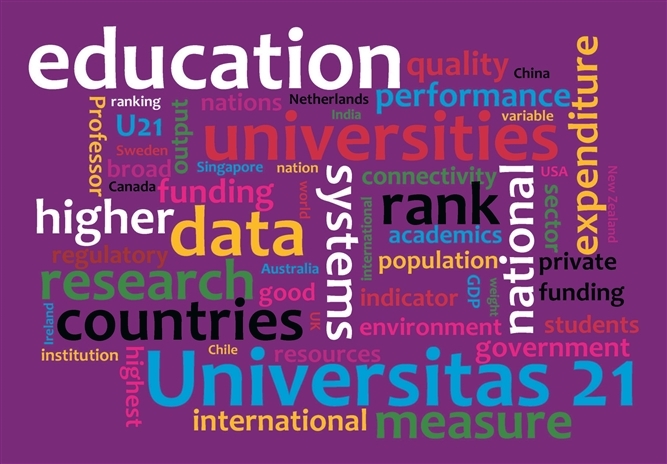 Nine Output variables are included that cover research output and its impact, the presence of world-class universities, participation rates and the qualifications of the workforce. The appropriateness of training is measured by relative unemployment rates. 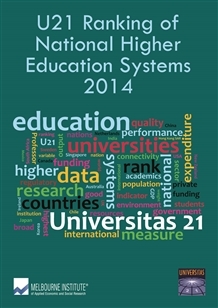 The overall country ranking is a weighted average of each module. The improvement in the scope of the Connectivity module has led us to increase the weight on this component from 15 to 20 per cent and to lower the weight on the Resources component by five percentage points. The weights used in the 2014 rankings are: Resources (20%), Environment (20%), Connectivity (20%) and Output (40%). The widened definition of Connectivity has seen an improvement in the rankings for several Asian countries, and a decline for several Eastern European countries. Overall, though, the leaders in Connectivity are Switzerland, Sweden and the United Kingdom. Environment is topped by New Zealand and the Netherlands. The top 10 countries are the same as in the 2012 and 2013 Rankings but with some minor swaps and the UK charging up the table from 10th to 8th and Switzerland sliding dramatically from 3rd to 6th. It remains a distinctive and perhaps less controversial method of ranking. The new U21 systems ranking. The project aims to highlight the importance of creating a strong environment for higher education institutions to contribute to economic and cultural development, provide a high-quality experience for students and help institutions compete for overseas applicants. The 2013 Rankings report retains the methodology of the 2012 Rankings. 22 desirable attributes are grouped under four broad headings: Resources, Environment, Connectivity and Output. The country coverage has been extended to 50 by the inclusion of Saudi Arabia and Serbia. Data quality has improved significantly since 2012, in some cases occasioned by publicity arising from the inaugural Rankings – thus meeting the hope we expressed a year ago. The top 10 countries are the same as in the 2012 Rankings except that Singapore replaces Norway which falls to 12th. The largest changes further down the table largely reflect the acquisition of better data: Malaysia rising from 36th to 27th and Ukraine falling from 25th to 36th. It remains a distinctive and interesting approach to ranking.